Peripheral neuropathy is the prime pathogenic ingredient in the recipe for diabetic foot ulceration. Ulceration, in turn, is the key factor that may precipitate a cascade of events leading to lower- extremity amputation. Clearly, identifying the presence of neuropathy (or more pragmatically, clinically significant loss of protective sensation) and taking action before any breach in the epithelium is of enormous import in any screening and treatment program designed to prevent amputation. Several modalities have been advocated to assist in this endeavour. Current research promotes early detection of neuropathy so that secondary prevention measures, such as intensive foot-care education and treatment, can be used for individuals. 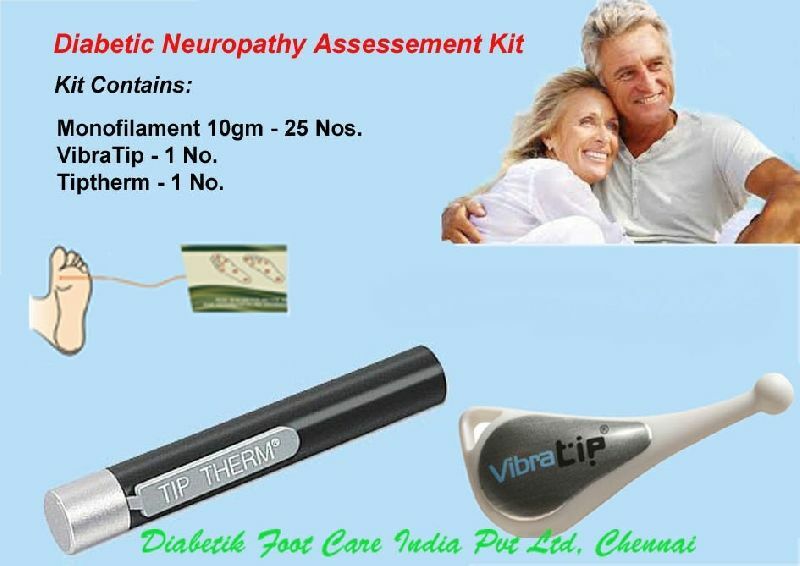 We have packaged three important simpler devices for the effective management of diabetic neuropathy. They are TipTherm, VibraTip and Monofilament 10gm. TIP THERM is an early diagnostic device for symmetrical polyneuropathy which measures temperature sensitivity of the skin. TIP THERM was developed to give the clinician and patient a convenient and easy to use method of testing. It works up to a temperature of 23o C.
VIBRATIP is a device resembling a small key fob that provides a near-silent vibration of consistent amplitude at a frequency similar to that of a calibrated tuning fork. It is intended for use when testing a person's vibration perception during routine checks for diabetic peripheral neuropathy (DPN) in people who have type 1 or type 2 diabetes. Monofilaments are an effective, convenient, easy to use, relatively inexpensive way of testing for loss of protective sensation in the feet in daily clinical practice.